Exhibiting Your Artwork in Kyoto, Japan - be-kyotos jimdo page! There are a lot of galleries in Kyoto. First, identify a gallery that matches your art. Some galleries might specialize in photography, others in sculpture or oil painting. Be sure to check whether the gallery is a rental space or not. Most galleries in Japan are rentals and are used for personal exhibitions. There are also galleries that feature special exhibitions or permanent exhibitions. You can exhibit any artwork at be-kyoto regardless of whether it is two or three-dimensional. be-kyoto is a rental gallery. We also hold special exhibitions with artists. 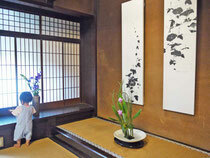 The building itself is a charming renovated Kyo-machiya (Kyoto townhouse) with more than 200 years of history. It features gorgeous woodwork, a spacious exposed beam ceiling and an authentic washitu (traditional Japanese room). “Art in Daily Life” is one of our philosophies. That is, we would like people to enjoy the arts in their daily lives. You can use picture wire, push pins, double-sided tape (non-aggressive adhesive), etc. to hang your artwork. We will also lend you tables and tablecloths for free. The people that visit be-kyoto are our clients, fans of the artists holding exhibitions, and both amateur and professional artists who happen by. The gallery is in a relatively quiet neighborhood compared with the more touristy downtown area around Shijo-Kawaramachi streets. We are blessed to have wonderful neighbors: the Kosho-in temple is next door and the Kyoto Imperial Palace is nearby. Our district may not be as busy as Shijo-Kawaramachi, but the people here are lovely. As we offer many classes, people who are interested in arts and culture often come for a visit too. Rental fees are based on the needs of the user(s). The gallery spaces for rent are the first floor (ground floor), the second floor (mezzanine) or both. We also rent space for a “petite” exhibition periodically. The larger galleries can be subdivided into seven smaller sections and rented for a reasonable ¥15,000 per week. For more details refer to http://www.be-kyoto.jp. It is important to create invitations or postcards and send them out to the people you would like to come to your exhibition. We offer design and printing services too. Our promotional services include providing the media with exhibition details, publicizing through our website and displaying invitation cards in the gallery. You are welcome to curate your own exhibition and decide how you want it displayed. An expert curator will be available to give you advice for displaying your artwork. Foreign artists often leave the curating and installation of their artwork entirely up to us. Complete curating and installation fees start at ¥10,000 per floor. Renting frames from be-kyoto can reduce your transporting costs. We will do the framing for you if you ship your artwork in advance. It is always fun to have an opening party, a class, a concert, etc. for an exhibition. You are free to do this at the gallery. Besides the main gallery spaces we have the 16-tatami-mat washitu (traditional Japanese room) and the Western-style room on the second floor. We encourage you to spend time in the gallery because it is a good opportunity to meet the many visitors. But we do have staff at all times to take care of visitors in your absence. You may offer tea, snacks and the like in the gallery. We have a stereo for background music, so you can even play your favorite music. We will give you a souvenir album of your exhibition as a gift. We hope it will be a nice memento for you. You will definitely be satisfied with the services at be-kyoto that cannot be found anywhere else. I am the gallery curator, Mayu Okamoto. I work at the gallery while caring for my daughter. It is almost 10　years since my husband (the gallery owner) and I launched be-kyoto. I used to work for an advertising agency and had no experience in the art world. But I am committed to learning about art from both professional artists and my husband. My husband also worked for an advertising agency. He has studied painting and is a photography instructor too. Everyone has his or her own artistic standard. We appreciate that. The owner has a great artistic sensibility and the ability to be objective. More and more artists are coming to him with their work. It would give us great pleasure to introduce you and your art to Kyoto and the world by having an exhibition here. We hope we can help you with your future artistic activities whatever they may be. be-kyoto is a beautiful and inspiring space that can be adapted in many different ways for many different people. As the name of the gallery suggests, it can “be” what you want. Nothing could be more special than an old Kyo-machiya (Kyoto townhouse) built over 200 years ago. We hope to create a lasting impression on the arts. I can speak and understand a little English, and am trying to learn more. I communicate with foreign artists mainly by e-mail up until their exhibition. We are working to improve our services and support your activities as an artist. We can arrange a translator if you like.